Have you ever been involved in a Book Club? When we lived in Belgium I joined a Book Club organised by mothers from the school our daughter was attending. I really enjoyed meeting up once a month, having snacks and discussing the book we had all read. In fact several times I was pleased to have been in the club because I was introduced to books I would normally have not particularly thought of reading. Both of which I thoroughly enjoyed. I am also the type of person who seldom leaves a book unfinished even if it does not always keep my attention and takes me months to actually finish it because I will go off and read other books in between spurts at the boring one. However during my time in that book club there were two books which I did not finish. This just seemed to me to be rather boring. My daughter's then boyfriend was also an avid reader and we would talk about the books we were reading when he would be round at our home finding that we enjoyed a lot of the same books but we just could not agree on this one. He kept telling me that I had to persevere and get to the second half of the novel and then I would enjoy it. I could not see the point in that because I did not anticipate any more of my interest being grabbed when it was so dull so far, plus I had heard about an imaginary tiger in a boat so no it was not my scene. I have still never read the book and don't believe I ever will as there are always more books I want to read than there is time to read them. To me this one was just simply disgusting. I got to a certain point in the story where I knew I would never finish this book and at that precise moment I was in a Tram from Brussels to Tervuren with my daughter (who also adored The Time Traveller's Wife). I closed the book and told her I was not going to read any more and also told her that I hoped she would never read that book. Then when I was about to throw it into the bin at the tram station I stopped and took it on home with me. Had I changed my mind? No, I decided to take it home to dispose of rather than have the chance of being the person responsible for someone else coming along and picking it up to read. I have still not read the book and I know I never will. When I told the others at the Book Club that I had not finished the book and never would because I felt disgusted by what I had already read their attitude was one of complete amazement. I was immediately told that the purpose of reading this book was to be able to recognise the mentality, attitudes and behaviour of people in Afghanistan at that time. It was stated that I would not be able to understand the culture and what it is like to live there. It was even implied that I was burying my head in the sand and did not want to know what was happening in the world. I knew more about the country than they thought as I knew people who were actually working there. From that Book Club I learnt that I don't have to finish a book. If that book doesn't really interest me or is poorly written or is about a subject that I do not want to read about then I can just close the book or even destroy it. It is my decision what I read. What we put into our minds affects our thoughts and words and actions and emotions. It is better to put good wholesome things into our minds. I have a choice as to what I ALLOW to go into my mind. Yes the word allow is exactly the word I mean here, it is my mind and I need to take responsibility for what enters it. and I am sure you want to take good care of your mind. What you allow into your mind affects your thoughts and your words and your actions and your emotions. God has given us the responsibility to take care of every aspect of our lives and our minds are important to Him as well as our bodies. You have a choice as to what you ALLOW to go into your mind. Let's be encouraged that we can make a difference in our thoughts, words, actions and emotions by taking the responsibility for what we allow into our minds and seriously consider what we are reading or looking at or listening to or talking about on a daily basis. Oh how I relate to this, Sandra! I also used to be one of those people who HAD to finish a book no matter what. And now? Not only is it about content, but it's about my time!!! There are so many amazing books out there and as a writer and a mom of 3, I don't have time to read things that I am not gaining anything from or that's just putting junk into my head and heart. I need to read things that uplift me and encourage me and allows me to be a better writer, speaker, teacher, mother, wife and daughter of Christ in this world! Thanks for sharing! I couldn't finish The Kite Runner either, despite its reviews. Nope. Sandra, I am your sister in the Lord from the 31 Survivors. I totally agree. I can not read or even watch what will linger in my mind for days that is unwholesome. I have a page of who we are in Christ. This helps me stay centered. http://www.diana2rockwell.com/who-i-am-in-christ A great blog post my friend in Christ. This is a great post. I am trying to read Lord of the Flies so that if my children need to read it I know the content, but so far it is just awful. I did read A Thousand Splendid Sons by the author of The Kite Runner, and although I didn't keep the book because it was so graphic, I appreciated how vividly it displayed the horrors that women in that country must endure. It made me very thankful for my life. Overall, I totally agree with you though. I have children to raise, and I would like to do it with a mind that is full of goodness, and not overly immersed in the horrors of the world. I want to know enough that I don't disobey the Word and forget the poor, but not so much that it hinders the job I am given right now, raising my children. I recently saw a news segment on the importance of being aware of what you read or watch before you go to sleep, because it will affect the way you wake up. I have been trying to unplug for a while before bed and reading. You learned you don't have to finish a book. I need to embrace that because right now I'm reading an extremely boring book and I feel like I have to "finish" it. Hmm. I may just bravely rid my Kindle of it right now! THANK YOU! I used to be one who had to finish all books I started and I would read only one book at a time. As I have gotten older, I, too, have discovered I don't have to finish a book and for the very reasons you stated. There are so many GREAT books, why waste my time, emotions,and mental energy on something that is not a good fit? And now I even read more than one book at a time. Scandalous! I totally agree! I do this with books as well as music, movies, and television. If someone else in my home refuses to turn off a TV show that I don't approve of, I simply put my earphones in and listen to uplifting songs on my iPhone. What we ALLOW to enter our minds definitely has an impact on us! I completely agree with you! While I don't want to bury my head in the sand, I also want to take care with what fills my mind. I don't read/watch things that are overly sad or emotional as I know those will drag me down and take my heart to places that aren't productive. We are what we put in our bodies and minds. You are correct. You don't have to finish a book just because you started it. You get to choose what you put into your mind. I've not been part of a book club, and these are probably the two main reasons I would give for not joining one. I have learned I have to be very careful about what I put into my mind: music, television or reading. There are many times I have to say no, walk away, turn off or put something down for my own mental. emotional and spiritual health. so true! we have to really watch what we are putting into our minds. so much negativity already exists...so we have to take extra steps to make sure there are great things for our own well being! Oh yes! I am the same with finishing books I don't like (most of the time. I do have my limits!) but we do have to be careful and make wise choices. Great thoughts and correlation to your book club. We are responsible for what we put in our minds and we do have a choice. 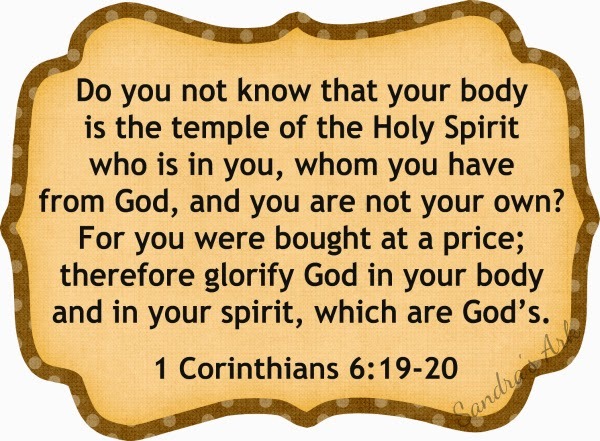 I love how you made the choice with books that you were reading and I love the verses you chose from 1 Corinthians 6. Blessed you linked up at The Weekend Brew. Hello Sandra! This may sound awkward because I'm an author but I completely agree with you. No one book is meant for everyone to like and enjoy. No one should be obligated to finish a book they're not enjoying. As I write my own books I know that there will be many people that will enjoy them and perhaps many that won't and that's okay. Of course I would like the whole world to like my books but that isn't realistic. For instance, I love most of Stephen King's books but my sister couldn't even get through one of them. While I completely admire the guy, she can't stand him. That's life––to each his own. Good for you! I've lost my compulsion to finish reading books--but it was a lot more difficult than it is for me to not watch movies or television shows that aren't uplifting (maybe because finishing a book is a compulsion ;) ). I discovered years ago that when I watched movies with a lot of bad language, I started thinking swear words (and I'm someone who eschews swearing of all kinds). Good for you if the book was not worthy of a good read, put it down. I like what you did with the one book, took it home to destroy lest someone else find it and read it. I enjoy Book-Bub and their e-books, many are FREE. Amazon.com provides a FREE kindle for your computer. I think it also works for those I-pads. You select the type of books they will offer you. I have some amazing Christian books on prayer that I am reading (3 at a time) There is a blue book mark to set where you left off. I just ordered Unlocking the Heavens: Release the Supernatural Power of Your Worship (paid 99 cents for this one) Most are free. Thanks for sharing your book club story with us here at Tell me a Story. Wise words, Sandra! We shouldn't allow feelings of obligation to any person or group of people or cause to outweigh our devotion to following God's principles. This verse came to mind as I read: "Keep your heart with all diligence, for from it flow all the issues of life." We must guard our hearts vigilantly, and an important aspect of that is guarding our minds. Thank you for linking this up with us at Grace & Truth! Sandra, I so agree with you! In fact, I had to write a well known publisher and ask to be excused from reviewing one of their books. It was suppose to have been written by a Christian, but it disgusted me. I was excused from reviewing it. I belonged to our libraries book club, once. I did not like their chosen books, so never went back. Complete truth here, friend! I agree-- I am VERY cautious about what I put into my brain/heart. I recently purged a lot of books that I had acquired in my pre-Jesus days... And it was so refreshing! Thanks for this reminder. Thanks for your honesty in this post!! I'm a mama of a toddler, so time for reading is sparce...but lately I have managed to read a lot (mostly when I should be sleeping, but oh well)...I'm reading Francine Rivers' newest book The Masterpiece and Loving it and I just finished Girl Wash Your Face, and HIGHLY recommend it!! Good words! Great to have you link up at Booknificent Thursday on Mommynificent.com this week!